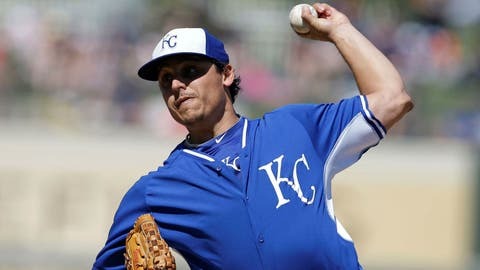 Jason Vargas pitched seven strong innings for the Royals on Saturday. SURPRISE, Ariz. — Alcides Escobar went 3 for 3 with three RBIs and Jason Vargas pitched seven strong innings to help the Kansas City Royals beat the Texas Rangers 8-4 Saturday. Former Royals closer Joakim Soria was told before the game he would be Texas’ closer. He gave up his first run of spring training in the eighth. Escobar hit a bases-clearing double in the Royals’ five-run second inning. Escobar also doubled in the fifth and scored on Justin Maxwell’s homer. "He was really good with the bat and glove today," Royals manager Ned Yost said. Vargas scattered eight hits over seven innings, allowing one run, while walking one and striking out five. "Overall, it was a good day," Vargas said. "Kept some innings from being prolonged. They are going to get on base. That’s how the game is, but you can’t dwell on it. The key is to make that pitch to get you out of the inning. I was able to get up close to 100 pitches without feeling really fatigued, so that’s a good sign." Tommy Hanson, who is bidding for a Rangers rotation spot, gave up seven runs on seven hits and three walks in 5 2/3 innings. "It’s never a good time to go out there and have that performance," Hanson said. "Spring is coming to an end and obviously, I wish I’d thrown better and have had more balls down. But I didn’t." Rangers rookie Michael Choice hit a three-run homer in the eighth and raised his average to .340. Vargas lowered his ERA to 2.14, throwing 63 strikes in 96 pitches. "Vargas was really good," Yost said. "He got us through seven innings under 100 pitches. That’s a perfect scenario right there. He gives up a hit and he gets back on the mound and makes pitches. He’s real efficient with his pitches. His command is really, really good, as good as anybody we’ve got at painting those corners. "I’m real pleased where he’s at. He’s ready to go." Royals left-hander Danny Duffy, attempting to earn a bullpen spot after failing to make the rotation, walked two and gave up Choice’s three-run homer in his only inning. Omar Infante (right elbow bone spur) remains sidelined. "I think Omar’s going to be ready," manager Ned Yost said. "If he has another hiccup, he won’t be. But if everything is going to plan, he’ll be ready for Opening Day."